Our world brightened even more on June 20th when Jane Ellis Arey entered the world quickly, easily and peacefully. She has been an absolute dream (which I hope to share more about later), and while I was intimidated by the transition of 2 to 3 girlies in our house, she has helped make it nearly seamless. The older squirrels absolutely adore her, and we are just delighted by her presence. 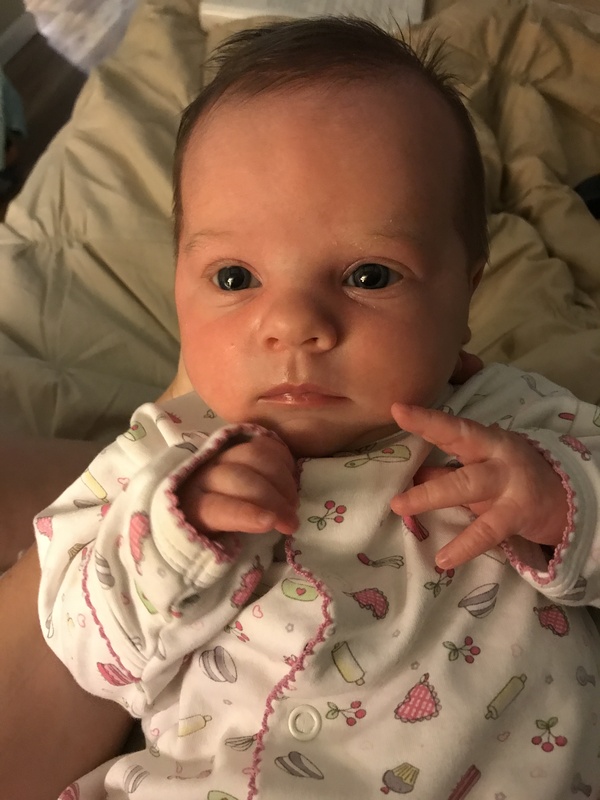 I didn’t take a maternity leave after delivery (I didn’t after Annablair either, and I also hope to tackle this topic in a later post), so I have had to change some of my weekly meal planning. It would be easy to stop planning, grocery shopping and cooking, but all of those are soothing activities to me, and after the chaos of our days, coming downstairs and spending a few minutes making a meal or preparing breakfasts and lunches for the big girls is calming and a wonderful transition from full court press Mom badge to nighttime working Mom while breastfeeding a newborn Mom badge. While I get out in public with all 3 ladies a lot, I’ve tried to limit our grocery trips all together to just necessity pick ups… milk, yogurt, fruit, etc. The big ones love hitting Publix, because it means a free cookie AND free balloon for them, but I prefer to use Aldi for my major hauls, and if you’re familiar with Aldi, it’s just not the most ideal place for 2 squirmy, “helpful” toddlers. A neighbor and I do childcare trade offs during the week, which gives me about 2 hours on Thursday afternoons (usually a non workday) to take care of that trip with just Jane Ellis in tow. I’ve been planning for more meals at a time (usually 10-11 dinners), which means I’m spending more per trip (about $160) and then supplementing with small trips as needed to grab those things we go through quickly. In some ways I feel a little more disorganized, because those supplemental trips add up, but I’m super thankful to have meals ready to go for more than a week. I’ve also been trying to choose meals that are a little less of the casserole/comfort choices I made in pregnancy and more plant-forward. Cookie Dough Energy Bites – I usually just thrown whatever I have into a food processor to make energy bites, but followed this recipe from arguably my top 2 favorite food blogs right now (Half Baked Harvest being the other) and loved the results. Brownie Batter Overnight Oats – I’ve made this so many times, but it had fallen out of rotation. I never keep protein powder on hand so always opt for the additional oats. Triple Vanilla Scones – make these immediately. Coconut Oil No Bakes – I get on a roll with these. But cut the sugar down to 3/4 cup. They definitely do NOT need the 2 cups called for. Easy Peruvian Shrimp – true to the title, this is super easy. Beyond flavorful. Very good. Farro Cobb Salad Bowls – these are different than my norm, but I’m a major farro fan. I also cheated and used bottled dressing instead of the recipe here. Smoky Chicken Salad Stuffed Avocados – I used chicken that David had smoked and did it my own way, but stuffing it in an avocado is an excellent decision. Excellent. Nashville Unfried Hot Chicken – holy moly this was fantastic. I can’t wait to make it again. As in, I’m putting it on my meal plan for next week. Spinach Feta Pine Nut Tart – you’ll see a trend here, which is veggie-stuffed savory tarts. New addiction. This was really great. I made it for a get together at my mom’s house as a little snack, and then I ate the rest of it for breakfast during the week with a fried egg. I’ve been working to get a vegetable in at every meal, and spinach for breakfast gets an A+. Lemony Herb Chopped Greek Salad – very, very good. And very easy. Just a significant amount of chopping. Roasted Tandoori Chicken – I used the leftovers in a curried chicken soup, which I recommend. Curried Chicken and Rice Soup – truth be told, I haven’t eaten this yet beyond a taste of it in the pot. It was, however, the perfect vehicle for the leftover chicken (above) and leftover herbs in the above recipes. It’s now in my freezer. Little Quinoa Patties – NB polished these off at preschool camp for lunches, and I loved them for snacks and to add to their dinner plates. Goat Cheese Quiche with Prosciutto and Tomatoes – my quiche and savory tart obsession is real. I’d made this before and loved it. Both times I added frozen riced cauliflower and peas to up the veggie factor. I ate this for breakfasts alongside sautéed spinach. Prosciutto Wrapped Halibut with Lemon Dill Caper Sauce – this was also excellent for leftover use. I had extra prosciutto from the above quiche plus extra dill. We had halibut in the freezer, and it felt fancy while being hella easy. Heirloom Tomato Pie – this pie will define our summer. I have made it 4 times now with farmer’s market tomatoes (and we’re jonesing for a 5th this weekend), and it’s hard to say whether David or I like it better. I have it for lunch today alongside a big spinach salad. Cheesy Zucchini and Corn Pie – See what I mean? But this is so, so good. Brie? Zucchini? Pie crust? YEP. Also, a note about the crusts of all of these. I ignore the instructions for the crusts in every single recipe. Instead I grab a couple of frozen crusts from Aldi and just follow the filling steps. Mashed Potato Pancakes – What a random but unbelievably delicious recipe. I grabbed a container of premade mashed potatoes for these. Tuna Nicoise Sandwiches – I forewent one large country loaf for individual sandwich rolls. It was a good call. I really liked these. I’m not positive I’ll make them again, but it was a really nice change up from our usual. I charred okra to serve with them, and that was a very good decision. Chipotle Steak Rice Bowls – Yep. Do these. Sheet Pan Crispy Cheddar Porkchops – These are really different for us, but the result was super yummy. I ignored the veggie instructions and just roasted Brussels sprouts using our preferred method plus a big salad. Chicken Parmesan Gnocchi Bake – The girls really loved this, and it reheats fabulously. So easy and tasty. Charred Broccoli and Lentil Salad – A departure from our norm, but a welcome one. I always want to like lentils more than I do, but this was a good step in the right direction.